Černý pulled another prank in 2009, when the Czech Republic ascended to the presidency of the European Union. Commissioned to create a sculpture in collaboration with other European artists as a symbol of unified Europe, Černý instead unveiled Entropa: a giant installation he made with two friends that portrayed the most embarrasing stereotypes of each EU members state. (For example: France is a banner emblazoned with the declaration Grève!–Strike!–and Italy is represented by masturbating football players). The Czech attitude is not to be proud of being Czech…It is a positive thing for me, but it also has a dark side, which is that we never won any war. In America, people are taught to be proud and as visible as possible. Here in this country, we are taught to be silent and invisible. Speaking of self-deprecating humor, Černý’s sculpture Piss–located outside the Kafka museum on Kampa Island–shows two men urinating into a pool shaped like the Czech Republic. Visitors can send an SMS to a number posted near the statue, and the two men will “write” the message with their streams of water. The giant equestrian status of Saint Wenceslas in Václavské náměstí (Wenceslas Square) is a symbol of Czech national identity, depicting the patron saint of Bohemia. 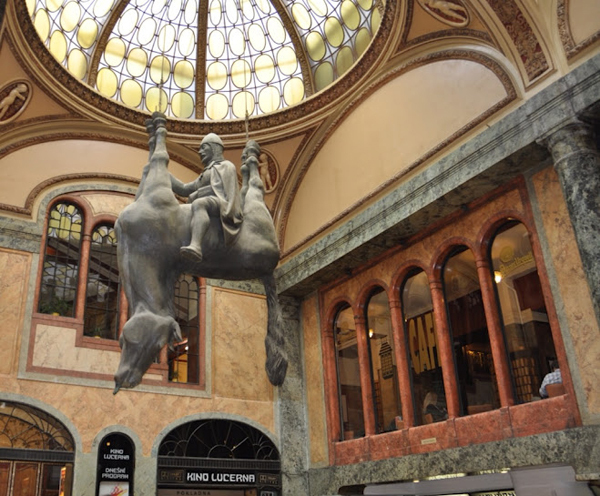 But if you wander off the square into the nearby Lucerna pasáž, you’ll find another Černý project: a massive sculpture of Saint Wenceslas riding a dead, upside-down horse suspended from the ceiling. The Žižkov TV tower is the tallest structure in Prague, at 216 meters. It was built between 1985 and 1992, and was reputedly used by the Communists to jam Radio Free Europe’s radio transmissions. 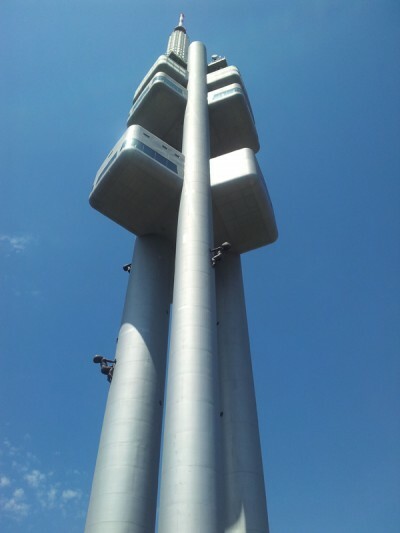 In 2000, Černý’s crawling babies were attached to the tower and now remain as a permanent installation. In 1989, before the revolution, East Germans fled en masse to West Germany through Prague. Thousands of refugees climbed the fence of the German Embassy, abandoning their cars in the streets of Prague. 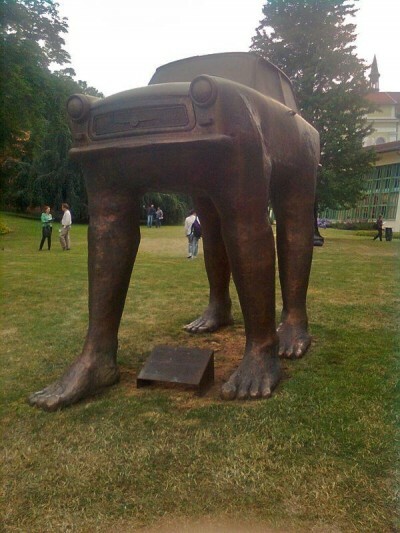 David Černý commemorated this exodus with the statue Quo Vadis, which depicts a golden Trabant (the cars driven by Eastern Germans) with legs. It is on display in the gardens of the German Embassy in Prague. 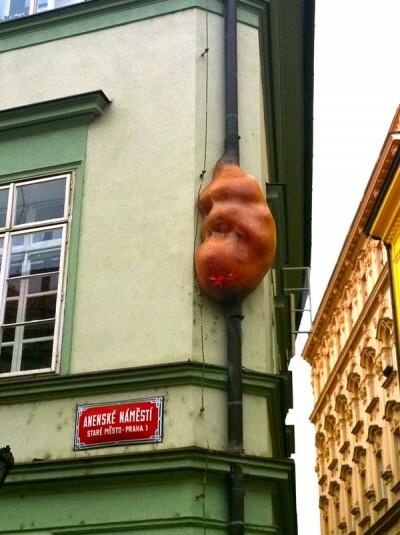 It’s easy to miss this installation if you’re not looking for it–an embryo on a drainpipe in Prague’s Old Town that glows eerily at night. 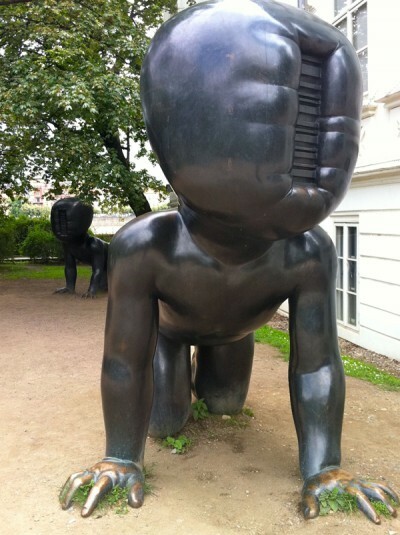 More David Černý babies, this time outside the Museum Kampa. 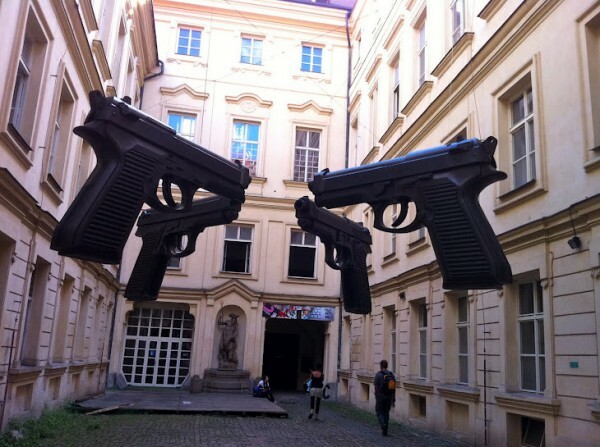 Černý’s installation “Guns” hangs in the entryway to the Artbanka Museum of Young Art. Meet Factory is an art space designed and founded by David Černý. Located in an abandoned factory, it is a combination artists’ residence, exhibition space, and performance venue. David Černý’s public art installations make a great, quirky walking tour of Prague. Click on the image below for my Google Map of Černý sculptures around the city. 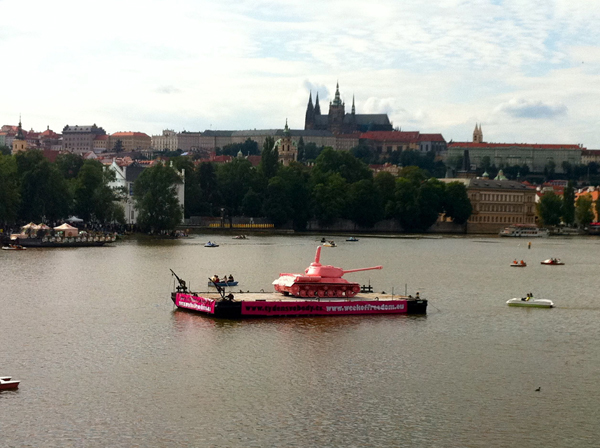 This entry was posted in Do, Prague and tagged art, camilla, czech, czech republic, david cerny, do, entropa, meet factory, modern art, pink tank, prague, sculpture. Great blogpost about David Černý. He has made a lot of great stuff, but not the Metronome, which it’s made by Vratislav Karel Novák – just read in the bottom of your own wikipedia-link, there you’ll find this information :-) Now a days you can also discover his works “Guns” and “Shark” at AMoYA – Artbanka Museum of Young Art, next to the Charles Bridge in Prague. Corrected–thanks for the tip! I’ve seen the Metronome attributed to Černý in a lot of places (including my own guidebook of Prague), so I had always assumed he was involved in the project in some way. I’m a big fan of the Artbanka Museum; thanks for stopping by! VERY GOOD ! Я был в Праге 2009 году и был приятно удивлён этим замечательным городом ! Особенно поразили работы Дэвида Черны ! Молодчина ! Я и раньше увлекался ЧЕХОСЛОВАКИЕЙ ,это конечно ХОККЕЙ ! жЕЛАЮ дальнейшего процветания !